From Sipalay City, we rented a van to bring us back to Bacolod City. We left Sipalay around 11 a.m. and reached the capitol by 3 p.m. 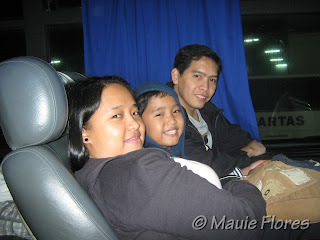 Since we rented the van for the whole day, we decided to push through with our planned visit to Talisay City which was supposed to be done the following day. 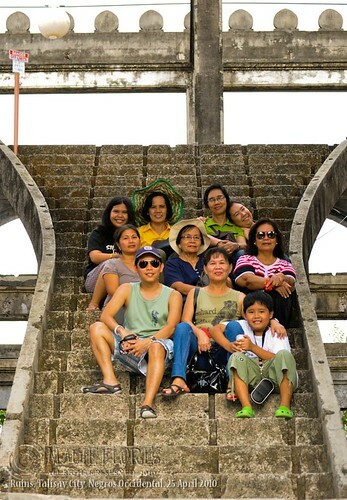 The Ruins is found in Talisay City which is in between Bacolod City and Silay City where the airport is located. On the road, I searched the Internet for instructions on how to find the old mansion because our Manong Driver was not familiar with the place. 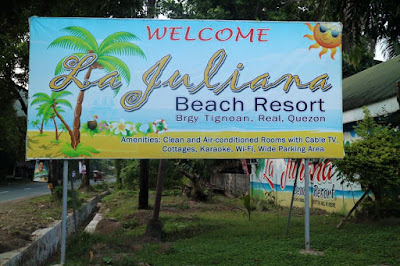 I found out that there are 2 routes going to the place: 1) via a pockmarked road passing through a sugar plantation in Talisay; and, 2) via Octagon Village in Bata, one of the many barangays of Bacolod City. We chose to take route No. 2. From the main road, finding the spot where we had to turn right was not a problem. A signboard was visible right beside the Pepsi Cola plant by the entrance to Octagon Village. But since it was a residential area, there were many streets that were not shown in Google Maps. We had to stop every once in a while to ask for directions. Don't worry, the residents are used to directing people visiting The Ruins and they'd be glad to help. 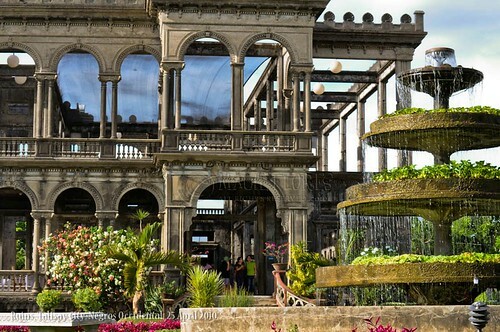 The Ruins was once a grandiose mansion in the 1900s and was owned by the sugar baron, Don Mariano Ledesma Lacson and his first wife, Maria Braga. 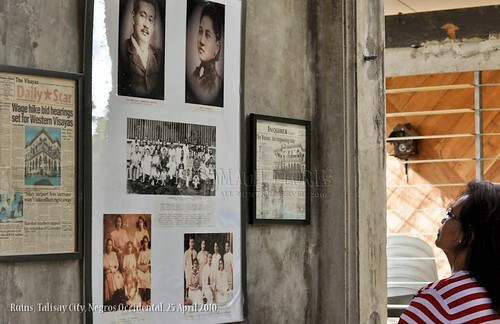 The mansion was burned by US soldiers and Filipino guerillas during World War II to prevent Japanese soldiers from using it as headquarters. The 3-day fire damaged its woodwork and roof structure. What remains up to now is its strong cement structure which was apparently made of grade-A cement. 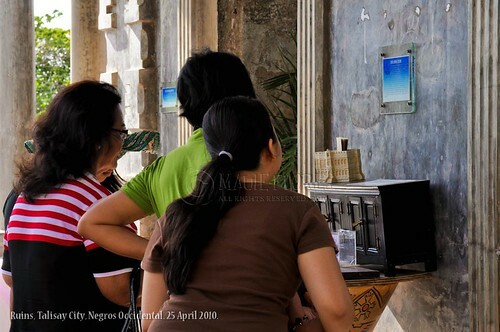 We paid 25 pesos per head for entrance fees and started going around the place. 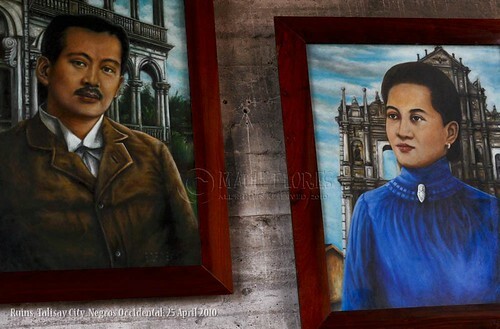 Most of the walls are adorned with memorabilia which explains the rich history of the mansion and the Lacson family. The fountain by the garden, which was part of the mansion's original layout, was our favorite spot. Each of us had our solo shots taken by the fountain. Actually, it is one of the many features of the old mansion that makes it a perfect reception area for weddings. Kids will never get bored in this place. 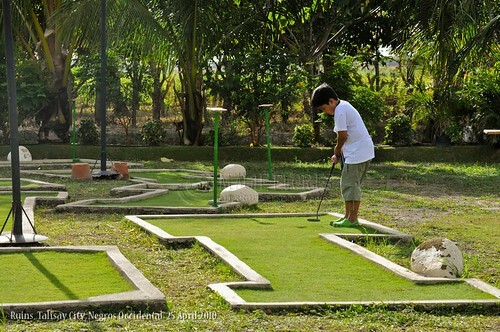 There's a mini-golf area that will keep them preoccupied while the adults stroll the vicinity. We paid Php 50/hour so Rap could play. 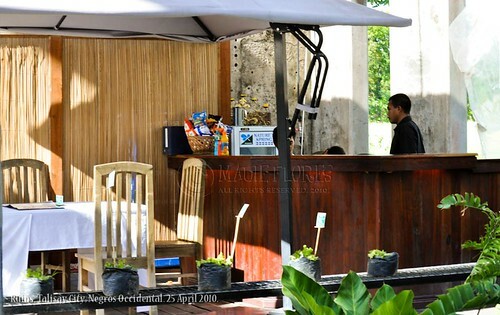 There's a cafe, al fresco style, within the old structure. They also sell affordable souvenir items to visitors. The Ruins is, indeed, a great place to visit with the family! 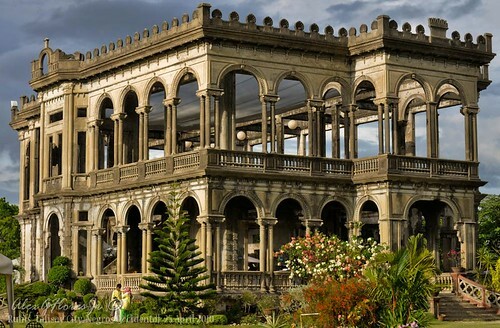 The Ruins is located at Talisay City, Negros Occidental. For inquiries, you may contact 0917-832-6003 or email lacson_mansion@yahoo.com.ph. there's even a mini golf! I love going to places like that with great history. Hi! I'm a travel writer myself, and was researching online for more info about The Ruins for an article after a visit and stumbled upon your site. Thanks for taking me back! Wow! just wow! I hope one day I get to visit this beautiful place too! 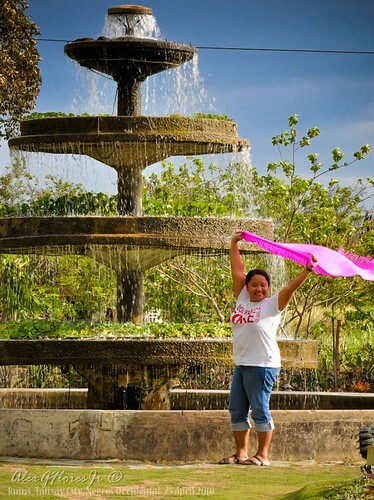 Bongga ang photo mo sa may fountain..pang Miss Universe!! !